Taoism came into being in China between 10,000 and 5,000 BC, and it was through the dedication and hard work of the early Taoists that they were able to develop so many arts and crafts from the foundations and guidelines given to them by the 'Sons of Reflected Light', a sect of people reputed to be over seven feet in height, and who wore a type of clothing that had never been seen in China before. Where they came from is still a mystery, and may remain a mystery for ever, but whilst they stayed they taught local craftspeople many different arts and crafts, which were far in advance of anything else that existed in those far off days. Many of these skills are still in advance of anything that is in existence even in this present day and age. Sons of Reflected Light over seven feet in height! ring any bells for anyone, sounds very similar to the Sons of Fire from the kolbrin? Here is the Taoist explanation of the symbol. In the Taoist arts both monism and dualism are symbolized by triangles, the one being an inversion of the other. The universe is symbolized by a circle, and this is seen as embracing the Yin and Yang within all things. Now I have heard discussion that the Star of David is in fact a Annunaki symbol, if this is the case then it is highly possible that the Taoist arts are a Remanent of Annunaki knowledge, considering that the Sons of Reflected Light are said to be Giants. This is highly interesting for me as there is a thread, via Maori Waka history and tradition that runs through Asia down through Korea, Taiwan to New Zealand, in relationship to the tall ones/Giants(Ancestors) that use to roam these lands, of which Giant Skeletons have been found not far distance from my current place of residence. A warrior is a man responding gleefully to the stern demands of manhood, even as a mother is a woman lovingly responding to the demands of motherhood. The two are akin, for what motherhood is to a woman war is to a man. This is a very interesting area of research, Ra! So you see, what we and the Chinese understand as Proper Taoism does not technically exist earlier than 2,700 years ago at the most. The stories of the 'Sons of Reflected Light' come much, much earlier. While what happened 10,000 years ago most certainly affected later Proper Taoism (and in some instances may be considered 'proto-Taoism'), it would be appreciated, if you are able, to provide substantive connections between the time frame and stories of the 'Sons of Reflected Light' to the time frame and writings of Lao Tzu. Pray tell, from where did you get the pic of the Magen David in china ? Interesting as it is a Kabbalistic Star of David, not usually seen inside a circle outside of the context of Kabbalistic pictograms and Synagogue walls Also interesting, it is painted blue, a colour extensively used in Jewish spiritual symbolism. Unless its the oxidisation of the medium, maybe copper, though that is usually green in colour. The use of blue in Hebrew religious symbolism, dates back to Avraham (Shumerian Ibru-um) and is quite possibly, like the Star (Actually "shield") of David, a link back to the Anunnaki, as Blue was a very important colour to them also, and is mentioned many times, and used a great deal, in all Shumerian pictograms and writing vis a vis the Anunnaki. I'd be very keen to know, where in China this pic was taken ! Sha'ul, here is the link for the picture the site does not give a location, I wanted to share the picture from the book, but to much of a mission, would have had to scan to file, so i just goggled, Star of David Taoism, and found the image in relationship. The spiritual secrets behind martial arts, tai-chi and yoga ! Coincidentally the page is quite relevant, as i am a practitioner of Tai Chi a Taoist martial art, the thing that attracted me to it 20 plus years ago, was the fact that it is a 3 dimensional defense system, and incorporates the physical/mental and the spiritual aspects, although the spiritual aspects are not studied or promoted as much as the physical side, what is interesting is I have found possible relationships between the meanings of the movements of the Tai chi form, and other practices like, kabbalah, and Tarot. Len, I guess like anything there are many divisions in thought regarding source, but among Tai Chi schools and history , it is the Sons of Reflected Light who brought the knowledge and taught to the locals. The book I quoted is from one such school. In about 600 BC, Confucius declared it necessary to cultivate the martial arts - further encouraging its assimilation into everyday society and culture. Lao Tzu (a Taoist sage), living at the same time, composed the Tao Te Ching (The Power and the Way), the original book and foremost source of Taoism. Taoism (pronounced "Daoism") is a philosophical system, and is also considered a way of life and a method of achieving higher consciousness. Legend has it that it was passed down from a legendary culture, known as the "Sons of Reflected Light" some 14000 years ago. It taught scholarship, meditation and alchemy. There is even speculation that Taoism and the Sons of reflected light was brought to china by druids, as there are many similarity's between Druidism and Taoism. Lol just getting a flash back from the past, My grandmother used to think i was a Chinese in a past life when i started practicing Tai chi on her front lawn as a Teen, now to find out it is possibly a Annunaki knowledge source, maybe i was a Annunaki in a past life!. It seems to me what you are presenting here is more a case of Chinese legend rather than anything that is explicitly Taoist. There may be, and have been Taoist thinkers that discuss legends of 'Sons of the Reflected Light', but that does not mean these legends are a part of Taoist philosophy or spirituality. This may sound like nitpicking, but it is an important distinction if one is to be taken seriously in research. The Yellow Emperor, or Huang-ti, is considered to have been the founder of Chinese civilization according to traditional mythology and numerous ancient texts, and he reigned approximately 2,700 B.C. Going back further, the god-like legends of the Three Sovereigns before Chinese civilization began mention rulers who taught the Chinese people farming, trapping, medicine/acupuncture, writing, irrigation and the like. Fu Xi, the first of these Three Sovereigns, is agreed to have lived around 2,900 B.C. (Many modern scholars believe these figures merely as myths, however, time and again archeology has proven more substance to "myths" than what skeptics believe.) If we are to hold these myths to be true, we do not have a claim for an advanced civilization of science in China earlier than 5,000 years ago. If legends of the 'Sons of Reflected Light' are to hold water, we have a very large time gap in civilization, science, and spirituality that extends thousands of years. What would be required to give more credence to the 'Sons of Reflected Light', and any connection they may have had with later Chinese culture, is to directly show what happened in this gap, and link philosophies and legends and culture from the earlier to the later. The one thing that does connect has little to do with modern conceptions of reality, which is the Tao itself, or The Way. The Way, the Truth, extends and exists through all men and all cultures, and can be recognized as such over time and space with no apparent direct connection. In other words, my connection with the Tao, or Way, does not require a direct, physical Teaching from the Ancient Ones to know what they knew. Over enough time, the same Truths once known are relearned as Truth, which does not change over time. This requires awareness, experience, and personal connection to the metaphysical foundations of existence... For how else did the ancient ones learn what they did? Eventually one gets to the point where there is no other earlier, advanced group to have learned from, except from Spirit and Awareness in the hard Experience of Reality directly. The one thing that does connect has little to do with modern conceptions of reality, which is the Tao itself, or The Way. The Way, the Truth, extends and exists through all men and all cultures, and can be recognized as such over time and space with no apparent direct connection. In other words, my connection with the Tao, or Way, does not require a direct, physical Teaching from the Ancient Ones to know what they knew. Over enough time, the same Truths are learnt as Truth does not change over time. This requires awareness, experience, and personal connection to the metaphysical foundations of existence... For how else did the ancient ones learn what they did? Eventually one gets to the point where there is no other earlier, advanced group to have learned from, except from Spirit and Awareness in the hard Experience of Reality directly. You hit the nail on the head there Len, each and everyone has the ability to do such, yet on a whole within society, we have so much division on the best way to get there, all interpret the symbols within the confines of there own light. The symbols are there for a reason, and helps in protecting the information from the ignorant, but when the seeker is ready! The symbols have a way or highlighting its corresponding frequency on other levels, which are detectable to the discerning individuals, it is still up to the individual to identify such, and realize the cause and effect initiated, normally activated by the everyday trials of life!. What else is the ultimate way to learn than from hard Experience of direct Reality? Is not that the purpose of life. Conscience is the best guide, and experience the best teacher. Nature is the best book, and life the highest form of schooling. Death is the great graduation day. Thanks Len, this is partly the purpose why I started this thread, so we can shed some light and start highlighting certain perspectives that will help us see a better picture of the past, history - Legends - Myth - all serve a purpose depending on the need, a lot of spiritual knowledge can be found within there telling. An example of that is within my own culture, and the legends about Maui(as you know, I suspect a strong connection to Moses/Noah), there is a spiritual teaching about the way in which Maui, brought fire to earth, from the burning tree, correlating to the biblical tail, yet a totally different perceptive, when viewed in contrast. The same lessons of information is to be found within many other cultures history legends and myth, to the discerning seeker. This is where i find it interesting, and have found other connection via the kolbrin, in regards to the standard of the serpent and eagle, the eastern perceptive is the serpent and crane. The east will validate the west, and the west will validate the east, when seen in contrast. The story of Chang San-feng is probably familiar to virtually all Tai Chi practitioners. Some like to think of this as a true account of the origins of Tai Chi, whereas others consider it merely to be a fanciful tale, and prefer to stick to what verifiable historical facts can be ascertained. Either way - as with most legends - there are perhaps more layers of meaning than at first meet the eye. I would like to reassess the story and offer an interpretation on a symbolic level. First let us look at the traditional telling. Legend tells us that the founding father of Tai Chi lived around the late 13th century and early 14th century. He left his position as a government official to live the life of a wanderer and a hermit in the mountains. Travelling from place to place he learnt techniques of meditation and martial arts under various Taoists. Until this time, most martial arts systems used great force, effort and muscular strength. Chang San-feng was dissatisfied with how these systems related to the principles and philosophies of his Taoist practices. One day, he was witness to a snake and a crane in combat with each other. He watched as the crane swooped down from a tree with its wings fully spread, the snake hissed a challenge which the crane took up by using its sharp pointed beak to initiate an attack. The snake used its deceptive coiling movements to evade the danger and responded by lashing at the crane with its tail. The crane lifted its leg to avoid the strike and then used its claws to attack. Again the snake evaded this by twisting and turning, whilst instinctively countering with its mouth. The crane curled its neck to escape the venom and beat its huge wings to force the snake away. Eventually, after tiring themselves out, the two combatants called a draw, the snake slithered away and the crane returned to its tree perch. Mesmerised and exhilarated by this contest – Chang realised that he had been witnessing a perfect exhibition of the I Ching principles of adapting to change and the ability to blend soft and hard, strength and yielding. The continuity and flow of the circular movements seemed in accord with his Taoist observations of nature. He studied the crane and the snake as well as other wild animals, the movement of water, winds and clouds, the nature of bamboo and trees. These natural movements and feelings were gradually embraced and incorporated into his new system. Chang San-feng lived in the Wu Tang Mountains and it was here that he taught several disciples. Today we see remnants of this story in the Tai Chi movements of ‘White Crane Spreading its Wings’ and in ‘Snake Creeps Down’. The crane and the snake are two creatures that are rich in symbolism. Before considering their dual significance within the context of this story, we should look at each of them individually. Wise to some of the symbolism, we can perhaps return to the Tai Chi origin story and look at some of its deeper levels of meaning. It turns out that the image of a snake and bird in combat is quite a regular occurrence in myths from around the world. Whereas in China it may be the crane and the snake, in the West it is usually the eagle and the snake, to Native Americans it is the Thunderbird and the snake, in India it is the Garuda bird and the Naga snake. The snake represents the earthbound, our physical and instinctive impulses, and living underground, it is considered to be in touch with the underworld (it is sometimes called ‘the master of the bowels of the earth’). By contrast, the crane, which soars into the skies, is in touch with the heavens and is analogous with the spiritual. The place where they both meet and interact is the earth. On one level, the Chang San-feng story is a pictorial analogy of the Taoist notion of humanity aiming to bring about a balance within ourselves between the yang energies of the heavens and the yin energies of the earth. This battle of the material and the spiritual, intellect and instinct, higher and lower nature, is an age-old battle that many philosophies and religions try to reconcile. The development of Tai Chi Chuan has been the coming together of two apparently contradictory areas. On the one hand, it has roots in the martial arts, which can be seen as its earthly nature, the need for survival and physical security. On the other hand, many of its practices are rooted in meditation and the healing arts. This adds the spiritual element to the formula. To do Tai Chi can therefore be seen as a physical manifestation of this interplay of opposites. It aims towards a dynamic balance; whilst at the same time acknowledging that both are necessary and ultimately inseparable (being aspects of the same). The practice encourages us to be constantly open to and sensitive to this ever-changing game (of rise & fall, open & close, advance & retreat, contract & expand, life & death, creation & destruction). Perhaps in few other areas is the paradoxical ability to harm or to heal so apparent. Use it well! Like the star of David, and two trees/try angels, we have roots in consciousness and not just physical, because of the time factor many physical evidence has disappeared, but we are still left with roots in consciousness, these are quite strong, its just that, that haven't been opened up on the collective yet, put the Vail has been penetrated, sow to speak, for its process to begin, in my opinion. You are correct, when you say. there is a big gap in history that has disappeared or being distorted, not just in china, but almost everywhere, I feel that my research within my own roots helps in sorting out this picture, and i hope more gaps will start being filled by different perceptions and angles or the ancient past, very exciting to say the least, i am currently looking into the work of an Irish Researcher by the name of Micheal tsarion's, highlighted for me by a watcher(angle), his work is very intriguing and highlights many other aspect related to the Kolbrin along with other ancient abnormalities, there is info regarding glastonbury at approx 21min onward. Could the Pyramids built in ancient china, be the work of Sons of Reflected Light? These pyramids are located in China, but up until a few decades ago, China has denied the existence of them. Chinese scientists claim that the pyramids are burial mounds, but since these pyramids have never been (officially) excavated, it is pure speculation that these pyramids are part of the tombs mentioned in written records. Most of what you read about these pyramids is based on speculation and anecdotal evidence, they could be much older than China reports them to be. Interesting link discussing some of the similarities. Ra I found these images from Chee Soo's books on Amazon.co.uk, although they do not contain the outer circle you mentioned. 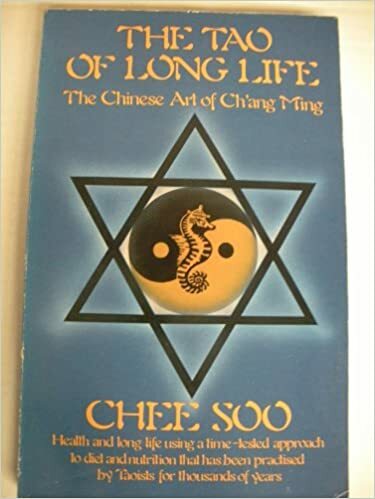 However I'm not sure exactly how much control Chee Soo had over the cover images of these books, the later editions of the Kai Men book for example had him doing weapons forms and the Chang Ming diet book cover had peppers which are not part of his Chang Ming diet. It is Dual Monism (the interlocking triangles), which represents the Yin and Yang of all phenomena in the universe (the circle). The six points symbolize the five elements and spiritual or macro-cosmic energy. It also shows the direction of flow of this energy from heaven and earth, and from earth back to heaven. The circle round the Dual Monism represents not only the universe, but also the void, which is the Tao. So the complete symbol stands for everything within and outside the cosmos — heaven and earth, the whole of nature and humanity, and all phenomena, known and unknown. All are one. 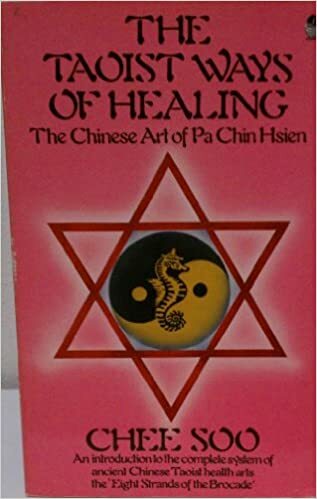 Unfortunately, we know no Taoist who uses the art of the talisman today, and so possibly another ancient art of the Chinese has been lost in the annals of time. I was a student of Chee Soo at his class in Leamington for several years and he told me that the 'sons of reflected light' were aliens! He told me that interviewers from a London radio station had tested his ability to project his mind to any part of the Earth (Remote Viewing) and were unable to fault him. They asked him, from London, to describe various scenes in Sydney, Australia. Then their assistant there would drive to and confirm the description - in every case correct to the last detail. It may be the missing part of his radio interview with Brian Hayes of which I found a part, I am hoping this interview may resurface at some point but no luck yet. Coincidentally I was doing sticky hands at Chee Soo's weekend course one Saturday and I got talking to my partner who I had never seen at the classes before and I asked him where he was from thinking he was a local, he said he was from Australia. I was quite surprised and I asked him how he had found out about the class. He said he had met Chee Soo on the astral plane and was told about the class and decided to come over for a visit and some training. Ra did you know Chee Soo? Although they do not specifically mention the Sons of Reflected Light I have found several videos on Youtube which put forward a similar theory: that the Chinese and also many other cultures were taught the arts and crafts by strangers from a distant land or in this case possible survivors of Atlantis. This would certainly match the dates at the end of the last Ice Age around twelve thousdna years ago when society was in upheaval and floods and sea level changes had drastically changed the coastlines and land masses.